Alaska's River Wild Adventures is here to make your Alaskan dream hunt a reality! Alaska’s River Wild Adventures is located some180 miles West Northwest of Anchorage. Laying on the West side of the Alaska Mountain Range. The main hunting area consists of 160 square miles of private property and is totally encompassed by state land (public). ARWA’s leases this parcel exclusively. Making ARWA’s the only outfitter in this area. Access to even Alaska residents is very limited. In the scheme of things, ARWA’s has its own private hunting area in the mountains and is located in some of the best Dall sheep habitat the state has to offer. One of the best parts, ARWA’s is able to hunt off of the private property and into the surrounding state land; which in turn, opens up an even wider area of prime sheep hunting real estate. The best part of it all, hands down, is that the hunts are conducted out of comfortable cabins. Very rarely does ARWA’s have to “spike out” on its sheep hunt. Meaning… client does not have to carry his/her house on their back. Which in turn, saves on carrying some 30 plus pounds of gear a day. Not to mention, the wear and tear on the mind and body. ARWA’s splits the season up into four, 10 day hunts and will typically take 8 sheep hunters and 4 moose hunters a season. No more than 3 hunters are taken during one hunt period. The 3 hunters may all be in one camp or they might be split into 3 different camps, depending on the time of year and the species that are being pursued. Roadhouse - This camp consists of a large log cabin. The roadhouse is located near the Farewell airstrip. This structure is our main base. This is where ARWA's stores all vehicles, tools, fuel, etc. during the off season. This camp is mainly utilized in the transition of to and from ANC or the different hunting camps. Upper Sheep Camp - This camp is located 15 miles up river from the Roadhouse, and is nestled deep into the mountains of the Alaska Mountain Range. This camp consists of 1 cook house, 1 small cabin (3 bunks), 2 framed in wall tents (2 bunks each), 1 shower house and 2 outhouses. All structures are equipped with wood burning stoves. Transportation and access to this camp is via two 1940’s Dodge power wagons (world war II vintage). Lower Sheep Camp - This camp is located 5 miles up river from the roadhouse and sits just inside the mountains. Camp consists of 1 cook house, 3 cabins (3 bunks each), shower house and 2 outhouses. All cabins are equipped with wood burning stoves. Transportation and access to this camp is via two 1940’s Dodge power wagons (world war II vintage). Grizzly Camp - This camp is located 8 miles from the roadhouse and consists of 2 cabins (2 bunks each) and one outhouse, nestled on a small lake, 1 of the 2 cabins contains a cooking amenities. Both cabins are equipped with wood burning stoves. This camp is one of the main moose hunting camps. It may be utilized during the first half of sheep season as well. Transportation and access to this camp is via argo. Moose Camps - These camps consist of white wall tents and or bomb shelter tents on a good size lake. Tents are equipped with comfortable cots and wood burning stoves. These camps are the least equipped compared to the other camps due to the remoteness of their location. However, that are comfortable and to say the least, this is one of my favorite moose hunting spots. Transportation and access to this camp is via float plane. All camps are very comfortable and contain all the amenities that are necessary to recharge the “batteries”. Electronically, physically, and mentally! A typical sheep hunting day starts around 7am with a full breakfast. After breakfast, the client will get geared up for a full day of sheep hunting. Sometimes taking off right from camp, but most often, jumping into the truck and riding up valley or down valley to park at the mouth of one of the side valleys. Form there the client, guide and sometimes packer will take out hiking/hunting up a side valley, staying in the bottom and constantly glassing up. Hunt their way to the back of the valley, top out and scan the surrounding area for sheep. Need less to say; when a legal ram is spotted, all efforts and tricks of the trade are brought out to get within shooting range to harvest that ram. Upon taking a ram or topping out without finding a ram, the crew will make their way back down the valley to the truck and back to camp. Once back at camp the client will be greeted with appetizers, refreshments and the opportunity to take a shower if he/she would like. A full dinner is served around 8 pm. The average sheep hunting day consists of covering about 10 miles and 2500 vertical feet. After hitting it hard for a few days, it is more than acceptable to take a day off (weather day) for a little rest and relaxation. With a comfortable camp and the amenities that it has to offer, it is very easy to recharge the “batteries”; as well as, getting caught up with ones reading, shower, laundry, trophy care and caloric intake. A typical moose hunting day starts around 6 am with a full breakfast. All moose camps are smack dab in the middle of prime moose habitat. Once daylight breaks a quick and careful inspection of the area is conducted. That big bull just might be standing in the lake that you are camped on. After the all clear, a slow and methodical 30 minute hike up to a high point (“look out”) will take place. From the look out, prepare to get settled in for the majority of the day and let the binoculars do all the work. Periodically the guide will preform a series of moose calls in order to bring out or bring in that big bull. September is the “rutting” period for moose. Bull moose become very vocal and tend to travel a tremendous amount in their search for cows. Patience is the “key” while moose hunting. During this time of the year, daylight usually lasts until 9 pm, so “cat naps” on the look out are well recommended. A warm dinner is served between 9 and 10 pm to cap off a long day on the "hill". Client will fly to Anchorage 2 days prior to hunt start date. Spend the night in ANC at a hotel. Morning prior to hunt start date, client will fly to Farewell airstrip via wheel plane out of Merrill field (ANC). 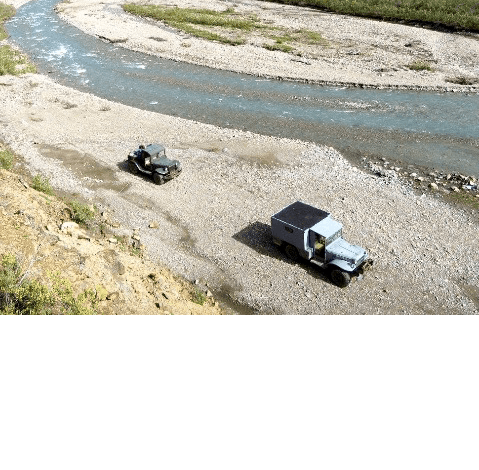 Upon landing the client will be pickup in the dodge power wagons/argo and transported to the prospective camp. At camp, client will be issued any and all hunting licenses and tags for the game that he/she wants to pursue, along with the pertinent paperwork in order to conduct a guided hunt. Sight in firearms. And then get settled into camp life. Hunt the allotted amount of days. Thus after the last hunting date, client will fly back to ANC. Client should book flight back home either late that evening or the next day. Note: Only after taking a secondary species will a trophy fee be due. All trophy fees are due before departing camp. ARWA's will schedule the flight. Flights maybe on wheels or floats. Flights include all transportation of trophies and meat back to Anchorage. $ - Hotel accommodations in Anchorage. Hunter may likely have a nights stay in Anchorage on each end of the hunt. $ - Expediting of all trophies and meat to client’s home or taxidermist.